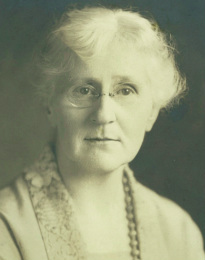 Mrs. Marie Fletcher. File photo. 1910 - The ladies of different “evangelical” churches met in the Baptist Church formed the Women’s Mission Union of Eugene. Mrs. Marie Fletcher (left) was the first president. 1928 - Encouraged the public to vote against theatres and picture shows opening on Sundays. - Held a Silver Tea for Chinese relief that was well publicized in the papers. 1942 - Supported soldiers stationed at the fair grounds by baking cookies. - Sponsored the daily 6 pm church bell ringing as part of the national minute of prayer to pray for the war-torn world, the nation, its leaders, and the men in service. 1946 - Made many “Kiddie Kits” for children under-5 for worn torn Europe and Asia. - Coordinated birthday and Christmas gifts for folks in nursing homes. 1979 - Held birthday parties for Goodwill Industries workers. - Helen Scott received the Eugene Sr. Woman of the Year Award.